in Tonga’s Ha’apai group of islands. While cruising over the last three years, we’ve seen oodles – ok – at least several hundred boats. In Georgetown Bahamas, there’s often 300+ boats in their harbor at a time in peak cruising season. Tonga’s Neiafu harbor easily sheltered 100 boats when we arrived. Admittedly, I’m generally lousy at identifying boat models (ditto automobiles and planes). It’s just not my thing. Yet certain boats really stand out. Of course when a boat mast is visible 12 miles away when others aren’t until 1-2 miles out, it’s memorable. The gargantuan masts of very large boats, like M-5, the world’s largest sloop sailboat (which we’ve seen -- the towering M-5 -- in several destinations throughout the South Pacific and met some crew of their affable crew in Pape’ete, Tahiti) masts are so tall they can’t pass through the Panama Canal’s tall bridges. 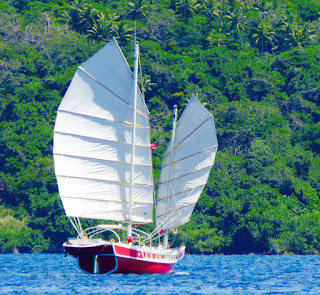 Note Lakatao’s unique junk sail configuration. 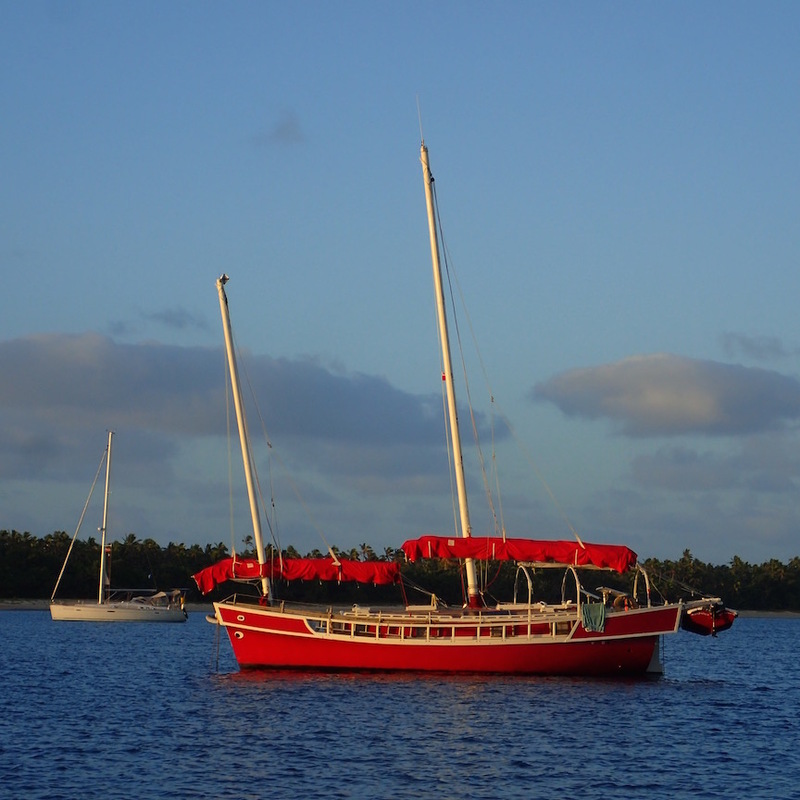 Here she’s sailing in Neiafu, Tonga’s harbor. Most boats are mostly white in color. Blue, especially dark blue hulls, are also not that unusual. And while less common, of course there’s classically designed often beautifully varnished wood boats, and silvery-grey aluminum boats. Black, red, yellow and green hulls are not unheard of, though it seems red in particular less frequently extends all the way up the hull to the deck. 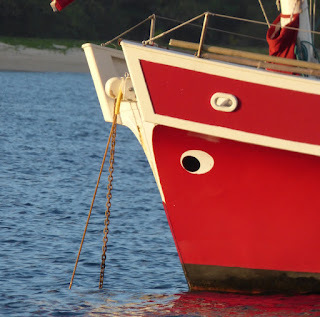 When the boat color’s red -- a vibrant red from waterline to deck -- it’s dominant and attracts the eye. All the more so if she’s large and curvaceous, with crisp, white trim. Add to it that it’s a junk (their masts are raked forward, their sails when hoisted, look bow-legged) – very rare where we cruise. Yes Lakatao has “eyes” looking out past her bow. he Chinese believe it’s to spot evil spirits in front of the boat. Enter Lakatao, which wins my award for the cutest red boat I’ve seen to date. We first spotted her (how could we not?) 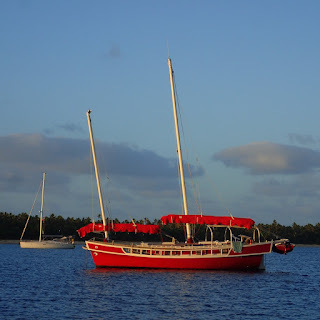 in Neiafu, Tonga’s harbor. 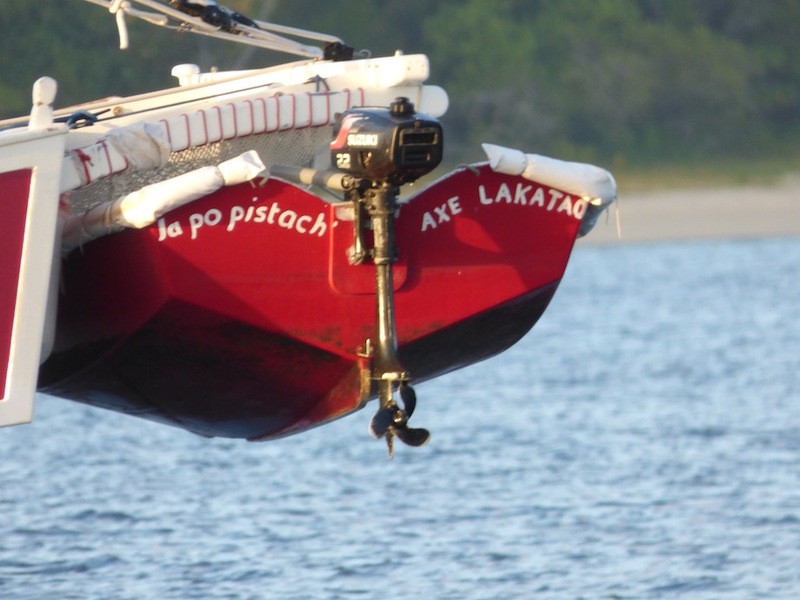 Of course, partnering a unique boat like Lakatao with a standard grey inflatable dinghy would just be wrong. Fortunately, Lakatao’s dinghy “fits.” It sports swoopy lines, jauntily dressed in the same vibrant red with white trim as Lakatao. 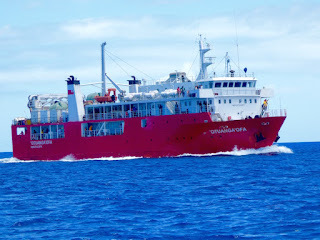 And so, I blog, from our plain little white hulled boat, traveling to at least some of the same exotic places as Lakatao. ferry to Pangai Ha’apai as seen on the way to Uoleva, Tonga. Recent retrospective of our time from October 21-25 2015 at “Uoleva Yacht Club” (aka TaliTali’Anga Eco Resort in Tonga, Uoleva Ha'apai (S19.50.863 W174.24.864). We moved onto anchor Nov 29 2015 across from Russell, New Zealand, (S35.16.353 E174.07.493). Lakatao is anchored nearby! Since we left Jacksonville Florida in December, 2014 -- less than a year ago -- we've sailed over 10,000 miles! A set of tables detailing all our stops will be added to the blog soon. New Zealand Bay of Islands: Arrived! Oy! Underwater Forest – Our Hull;(.